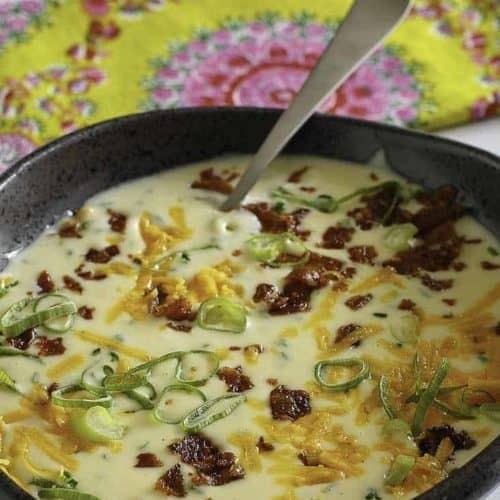 Houston’s Baked Potato soup is a really tasty version of this famous soup. Houston’s is well known for their tasty dishes, and they are specially known for the Houston’s Baked Potato Soup. Houston’s turns classic dishes into something special with the addition of a couple of extra ingredients. The fennel really adds a nice flavor. Houston’s Restaurant is an American casual-dining restaurant chain with an upscale vibe that is owned by Hillstone Restaurant Group. As of 2016, there were fifty-one Hillstone locations in thirteen states operating under various names. The restaurant group aims to provide a menu exemplifying consistency and quality in a way not usually found in this type of restaurant. If you would like to read a more detailed history of Hillstone and Houston’s, click here. Baked potato soup is famous among soups, and Houston’s Baked Potato Soup is a delicious version of this classic. Houston’s is primarily known for turning classic dishes into food that is extra special with the addition of some unusual, tasty ingredients. In the case of this soup, it’s the fennel that really adds a flavor that’s interesting and a little different. A green tint on potatoes means that they are old and well past their prime. Look for potatoes that are even in size and have consistent brown skin. If your potatoes have a few sprouts, remove them before cooking. Potato sprouts are not tasty and are believed to be poisonous. You may think so, when you taste this creamy soup. Russet potatoes are ideal for baking. They are shaped just right for whatever your favorite baked potato toppings are. I don’t know who first thought of baking them and making them into a soup, but it was pure potato inspiration. You can get an answer on the possible origins of baked potato soup from Dr. Potato – just click here. For a couple more ways to cook baked potatoes, click on the links below. Fennel is a perennial herb that is part of the parsley family. The slightly sweet tasting, anise-flavored fennel seed is one of the most widely-used ingredients in cuisines all over the Mediterranean region. Fennel seeds are high in minerals, vitamins, essential oils, and other health-beneficial nutrients. You can read more about fennel seeds here. 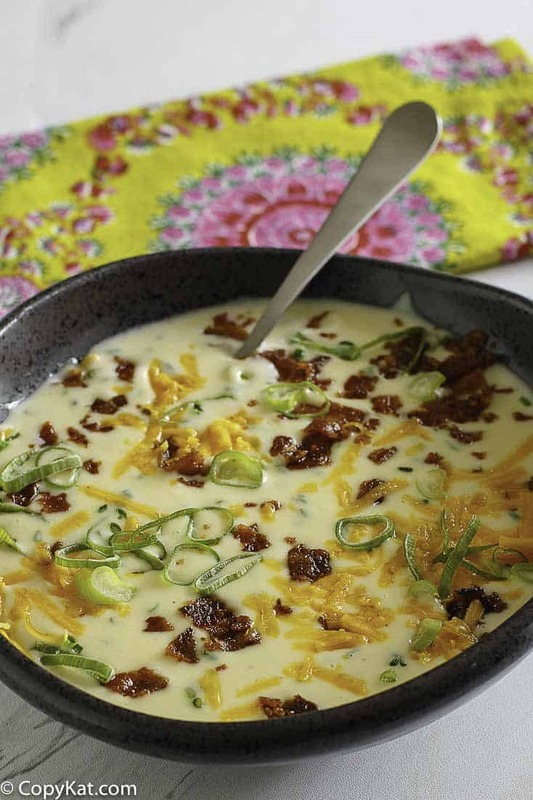 Enjoy Houston's Baked Potato Soup at home. Wash and scrub potatoes, pat dry. Rub potatoes with butter and place in baking pan, bake at 350 for 1 hour and 15 minutes or until the done. Remove from oven and cool slightly. When the potatoes have cooled enough to touch, peel 4 of the potatoes, we will need the skin on the 5th potato. While potatoes are cooling, add fennel seeds to milk and half and half, and scald the milk. Scalding is heating milk at a moderated temperature just until a boiling point but not boiling and quickly remove from heat. Scalding will keep the mixture from separating. Let milk cool slightly with fennel seeds in the mixture. When potatoes or cool enough to work with carefully cut 4 in half and place in a food processor. Potatoes should measure out to 1 1/2 - 2 cups cooked potato. Dice the 5th potato and set aside, leave the potato skins on this potato. To the cooked potato add sour cream, chives, salt, pepper, celery salt and 1/2 cup plus 1 tablespoon shredded cheddar cheese. Strain the fennel seeds from warm milk and discard seeds, pour milk mixture into food processor and processes 1 1/2 - 2 minutes until smooth. Place mixture into a saucepan add butter and diced potato stir frequently and simmer on very low setting for about 15 - 20 minutes. 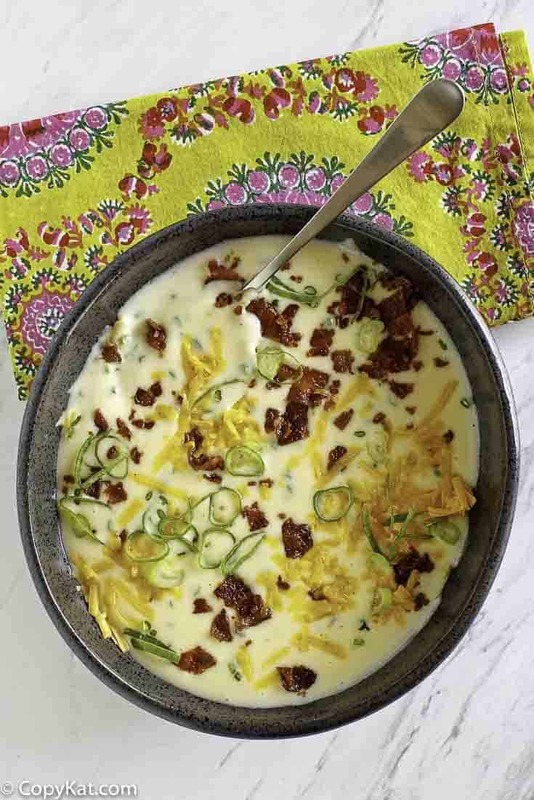 When ready to serve ladle into individual bowls and garnish with cheddar cheese, bacon, and green diced onion. Is it fennel or tarragon? You forgot to mention how much you liked it!! This recipe is fantastic. Thank you!! AAHH! Houston’s! I haven’t been to one in over a dozen years. I used to LOVE their Asian (They called it Oriental then when they weren’t so PC) Chicken Salad. It had crispy tortilla chips (even though it was Asian) and a lot of cilantro and a delicious honey-lime dressing. I used to recreate it myself all the time, but haven’t done it in a while. Might have to make it tonight, but would love the real recipe. I wonder if they still make it. California Pizza Kitchen used to have a great version, but they stopped using cilantro consistently, substituting basil and that just wasn’t the right sub.